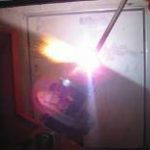 APS - Air Plasma Spray - Pyrogenesis S.A. Plasma is produced by generating an electric arc between two electrodes and passing a stream of gases through the arc. The plasma energy is used for melting and accelerating the feedstock material, which is in powder form. Argon, hydrogen, helium, nitrogen are the common gases used for the plasma generation. 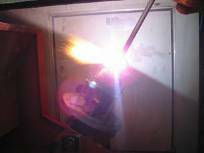 Flame temperature can exceed 10000°C in the core of the plasma jet, while spraying velocities range between 350 — 700 m/s. Nevertheless, the substrate temperature during spraying is low (< 200°C), thus it is not affected from severe temperature variations.